UNITED NATIONS, March 25 -- The UN mission in Sierra Leone doesn't get much press coverage anymore. Some say it's because the news media only wants (bad) news. 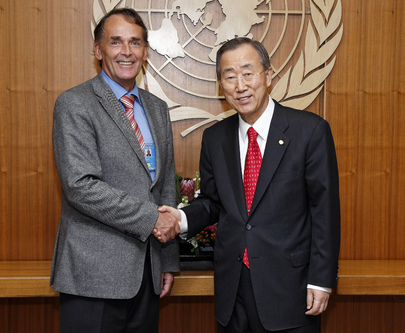 Inner City Press has previously covered von der Schulenburg: that he hit a UN staff member, that he applied to replace Jean Maurice Ripert as humanitarian envoy to Pakistan, that he dealt in carpets on a previous UN assignment in Iran. But since Sierra Leone has been so under served by the UN, Inner City Press asked the panelists what the new agency UN Women can do for them. The answers weren't entirely clear; nor was the call for nations to take action to ensure “peace” in Cote d'Ivoire. Does that mean intervention by Nigeria? Or more talks? Inner City Press did ask von der Schulenburg about the humanitarian envoy to Pakistan post. He laughed and said he is not going anywhere. Right: the Pakistan post was given to a candidate from Turkey. But what is the future of the UN mission and mandate in Sierra Leone? What was asked but not answered. Watch this site. UNITED NATIONS, March 24 -- What do Libya's neighbors think of the military action there? While at the UN Western diplomats whisper anonymously about permission to use Sudan's airspace to conduct air raids against Gaddafi, Inner City Press on Thursday asked Chad's Permanent Representative to the UN Ahmad Allam-mi about his country's position. Earlier in the week, after the Security Council's March 21 closed door meeting on Sudan, Inner City Press at the televised stakeout asked Sudan's Ambassador Daffa-Alla Elhag Ali Osman for the Omar al Bashir government's position on the no fly zone and action on Libya. Video here, from Minute 9:39. Daffa-Alla Elhag Ali Osman said of Sudan, we are members of the Arab League and fully comply. Inner City Press asked, but isn't Sudan also a member of the African Union, which has expressed doubts about the air strikes? “Whatever is agreed to in each of that, we are committed to that,” Daffa-Alla Elhag Ali Osman said and then walked away from the UN microphone. The next day, a Western Permanent Representative told other media that Sudan had granted permission to use its air space to enforce the no fly zone over Libya. While Daffa-Alla Elhag Ali Osman declined to several media to confirm this, the whisper campaign was said to be “confirmed” and reported. Inner City Press asked on March 24 asked a senior diplomat of a non-Western Permanent member of the Council about the statements about Sudan. “Why would they be leaking that?” was the diplomat's response. Why indeed. Footnote: At the March 21 stakeout, Daffa-Alla Elhag Ali Osman told Inner City Press that the UN's Atul Khare in the Security Council's closed meeting had blamed recent deaths on the SPLA and South Sudan (as well as denying any shuttering of El Fahser University or crackdown in Darfur). Inner City Press: I wanted to ask about Sudan. The SPLA [Sudanese People’s Liberation Army] has said that the northern — the Government of Northern, or of Sudan – has bombed western Bahr El-Ghazal State from the air. I wanted to know whether that’s given — whether UNMIS [United Nations Mission in Sudan] is out there and looking — whether they can confirm that? And also, I know that there was a meeting on Monday of the Council where Atul Khare briefed. There was no readout by the Council after it. 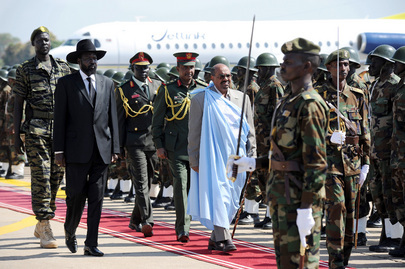 The two — South Sudan and Sudan — both had totally different public statements about what the meeting was. The Government of Khartoum said that Atul Khare backed them up totally, said that the violence is totally attributable to South Sudan in-fighting. So I wanted to know, again, does UNMIS believe that Khartoum is supporting, materially or otherwise, Athor and Lam Akol, the two renegade Generals within South Sudan’s fighting? Spokesperson Nesirky: I’ll check with my colleagues from the Department of Peacekeeping Operations whether there are any further details that we can make available from that briefing that you referred to. As to the reports in which South Sudan says that the North has bombed its territory, the UN mission in Sudan has received reports of aerial bombings by the Sudanese Armed Forces on 21 and 22 March — in other words yesterday and the day before yesterday — in Firka and Timsaha in Northern Bahr El-Ghazal State. And I can tell you that the Mission is investigating these reports. That’s what I can tell you. Alright, thank you very much. Have a good afternoon. So the UN leaves unchallenged the statements on Sudan. Inner City Press is told that, while not of consultations, the UN does keep written records of “closed” Council sessions. Watch this site.